My Mother-in-law introduced our family to this recipe almost 20 years ago, and now it is a staple at every family cookout or gathering. I'm giving you the family sized recipe, If you are taking it to a cookout you'll want double the recipe, this'll be the dish they keep coming back for seconds of! Jan's tip: A 5 lb. 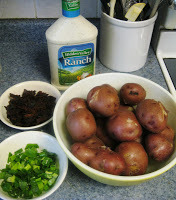 bag of red skinned potatoes usually has about 12-14 potatoes so when I'm doubling the recipe I just cook up the whole bag. 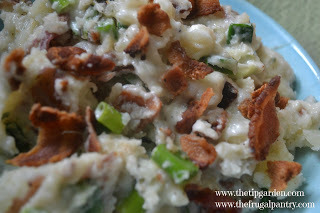 Being the cheese-a-holic that I am, tried adding shredded cheese to it over the years to make it more of a "loaded potato salad" but honestly, the simplicity of the original 4 ingredients is perfect, but feel free to play around with add-ins's. Boil potatoes (keep skins on) till cooked through. While potatoes are boiling cook bacon till crispy and crumble.